If you’re short on time, here’s the micro ukulele lesson that I created on Instagram for this one. It’s a really easy song to play and it has just 4 chords in it and none of them are particularly tricky to master – the G7 is about as difficult as it gets (and that’s pretty easy). I’ve included the chord boxes here for anyone that’s not familiar with them already. For the record, I’d recommend playing the Am chord with your second finger rather than first for a more fluid change to the F chord that follows. Finally, if you really want to push it a little bit more, you can try hitting the body of your ukulele for a more percussive sound. On the audio example above I’m playing one down strum then slapping my hand down on top of the strings and then playing an up strum. Give it a try, it takes a little getting used to but once you slap the strings your hand is in the perfect position to play an up strum. Keep the timing really relaxed and you’re all done! Adding second down with chunk is really great! 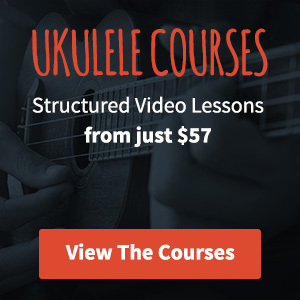 Can you explain ”try hitting the body of your ukulele” ? When/how? Yeah sure, instead of playing your chunk raise your hand off your uke and just slap down directly on the strings. This will leave your hand sat on top of the strings ready for the up stroke directly afterwards. When I play it with the slap I tend to switch the pattern up to be much more basic and I go with D-SU–S- (S being a slap). That mean that I’m not playing anything at all on beat 3. Beats 2 and 4 become slaps. I threw a few example audio files into the post to help. Thankyou that actually helps me out a lot as well! Hey George, the chord boxes shown here are for standard tuning on a soprano, concert or tenor. 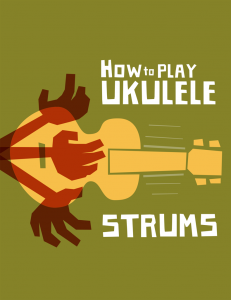 If you need check out this page – how to tune a ukulele. In the strumming pattern section, you explain the strumming as DDUUDU. Then when you add the chunk the pattern becomes DUXU-UDU. Shouldn’t your new pattern be DDXU-UDU? Hey Maria, it actually probably should be D-XU-UDU but if you listen to the recording I am actually playing the up strum after the first beat (just before the chunk). The chunk adds enough emphasis on that second beat that you can get away with playing the up strum before. I hope that makes sense! First off, thank you for this. I’ve just started playing the ukulele and this site has been really really helpful. I guess that part of the song goes C C Am Am F G as the rest of it. I just want to ask if there’s a particular reason that part isn’t included in the songsheet. Hey Paolo, glad you’re finding the site useful. I’d love to give you the answer to why that section is missing but I honestly can’t remember. I’ll add it on to my list and get it updated! Hi all, I’ve just got a Uke and I love the thing already despite losing my lovely fingernails. After three weeks I find that my finger ends are starting to harden up but i still have days when I have to grit my teeth to play for a few minutes. I’ve just started trying different strumming patterns but I still find it difficult but I value the time I have to practice and find I feel guilty if I only manage to pick my Uke up once a day, someone did warn me it was addictive! My Uke is a Rocket soprano,it was very cheap but I think she sounds great though at some point I know I’ll want a concert, did I say someone told me it was addictive! Wow! I’m having a hard time coordinating the strumming. How can I tell how many bars to play when I am playing different songs? The sheet music only shows the UD. Should I just do 2-2-1-1?? ?